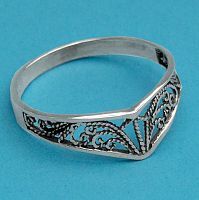 - Who can resist the soft glow of sterling silver, especially when the ring is as delicate and lacy as this one is. As lovely as it looks in the picture, I assure you, it is even prettier in person. It is eye-catching and elegant, whether you choose to wear it alone, or as a stack ring with others. Available in sizes 5-9, whole sizes only. 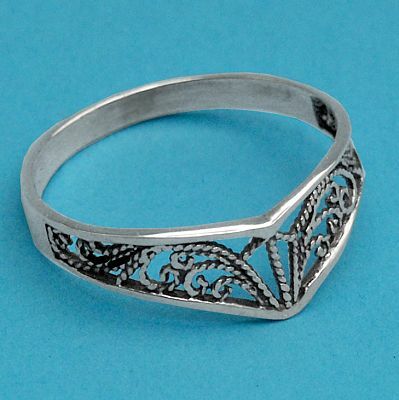 Do you have any other questions about our Silver Filigree Chevron Ring? I have been wearing this beautiful ring everyday for years. I recently lost my ring. Gryphon’s Moon had the same ring available after all this time. Still great quality! I’m so happy to be wearing it again. Last year, my husband and I got married and we did a lot of ring shopping, but we preferred to get something inexpensive and also meaningful -- Less traditional, and more simple, with a bit of Celtic flair. My engagement ring is not a straight band, but diamond shaped, and so it was difficult for me to find a ring that fit perfectly, This one did, and it has a similar pattern to my other ring. Together they look just beautiful. When I saw this ring, it was exactly what I wanted. When I got this ring, it looked even better! It is very well crafted, and it is very elegant and detailed. It looks like white gold, even though it's not, and that's why it looks so great with my white gold engagement ring. I honestly don't think I could have picked out a better ring ... way better than a chunk of diamonds or gold. Way better ... if I could choose again, I would still choose this ring. Very durable as well, even though it looks dainty and elegant. I never take it off, and it's been through a lot. Still holds up and looks brand new. YAY! Love it, and would definitely recommend it very highly! A beautiful ring, so glad I bought it. This ring is beautiful. I had only bought it as an afterthought because I was trying to pad my initial purchase a little in order to receive the discount. I'm glad I chose this one as it's positively stunning. I would recommend it as a holiday gift. Once I got the ring, I haven't been able to take it off. It is an absolutely beautiful ring. 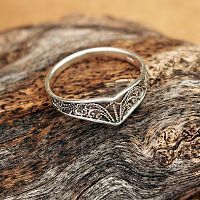 I bought it for the purpose of getting people to stop asking me out, and the first day I wore it I got asked if i was married because it looked like an expensive ring, when in truth it was on $16 (plus shipping cost)!!! I could not be more satisfied with the decision to buy this ring, and if I could I would buy one for all the women in my family, as well as all of my female friends!!! Silver filigree chevron ring; the prettiest I've ever seen.